To be considered for an Excellence (Vanguard, Academic, Val/Sal, Leadership, PMA) Scholarship, a student must apply for admission to the University on or before February 1, 2019. With all academic credentials (high school transcript and ACT/SAT scores) being on record, the student will automatically be considered. In addition to the required academic credentials, the appropriate high school official must submit a letter documenting the student’s rank as first or second in the graduating class. Home-schooled students are not eligible for the Valedictorian & Salutatorian Scholarship. To be considered for a National Merit® or National Achievement® Scholarship, a student must apply for admission to the University and submit a letter documenting his or her selection by one of these national organizations. Selection as a National Merit® or National Achievement® Finalist* or Semi-Finalist will qualify the student to be considered for one of our top Excellence Scholarship awards. Participation in the UNA Honors program may be required. • Activity resume required. Please send resume to admissions@una.edu. 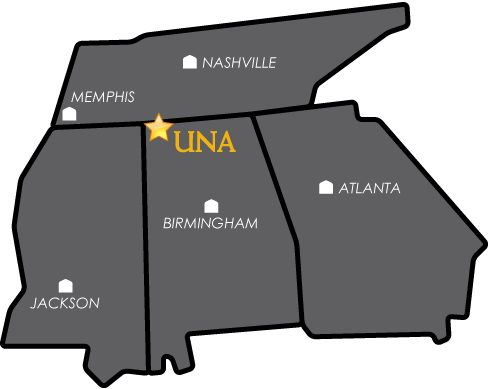 These competitive scholarships are awarded to students who, based upon a strong record of leadership and volunteerism in high school, have demonstrated the potential to be campus leaders at UNA. In addition to the required academic credentials, a one to two page detailed resume of all activities performed during the 9th – 12th grade years must be submitted by February 1, 2019. In order to receive the Leadership Scholarship, you must be able to provide a demonstrated record of academic success, leadership and community involvement. To receive and maintain the Leadership Scholarship, students must be willing to participate in our comprehensive program that promotes personal and professional growth throughout all four years at UNA. Peer-to-Peer mentoring roles such as Student Leadership Consultants and/or Peer-to-Peer orientation positions such as SOAR Counselors, Navigators, LaGrange Society & Residence Life (RA) positions. Campus leadership/service activities and programs such as Honors Program, Service Saturdays, Alternative Breaks, Miss UNA, Leadership Retreats & Seminars, etc. Over 120 registered student organizations that provide direct links to academic interests; artistic pursuits; recreational, competitive and intramural sports; community and volunteer services; social issue and peer education programs; cultural awareness; and career development. Performing Arts programs and organizations such as band, choir and theater. These special designation or special recognition scholarships include, but are not limited to, National Merit and National Achievement finalists or semi-finalists, All Alabama Academic Team, Distinguished Young Women, Gorgas Scholars, Bryant Jordan Scholarship winners, State of Alabama American Legion High School Oratorical Program 1st place winner, Youth Leadership Development Program, and other recognized academic or leadership organizations. Such students are eligible to be considered on the same basis as other students meeting UNA’s scholarship due date and eligibility criteria. A student may receive the higher of any qualifying UNA Scholarship. A student will not receive more than one Excellence Scholarship. Scholarship offers of any amount to students who have achieved a special designation or special recognition based on performance in extra-curricular activities or academic competition are not guaranteed. All scholarship awards are subject to change depending on fund availability, budgetary constraints, and the size/quality of the applicant pool. No commitment shall be made by any party on behalf of the University other than authorized officials in the President’s Office or the Director of the Office of Student Financial Aid. All offers may not be equal in either dollar amount or renewability terms. • The maximum amount of any such combination of offers will not exceed $12,000/Year. • The Excellence Scholarship priority date is February 1, 2019. To be considered for an offer of one of the University’s Excellence Scholarships, an eligible student must apply for admission to the University and submit all required academic credentials (including, but not limited to, high school transcripts, ACT/SAT scores, and activity résumé) by February 1, 2019. • The University will use the unweighted GPA from the student’s high school academic transcript submitted to the Office of Admissions on or before February 1, 2019. The University will not accept a higher GPA submitted after February 1, 2019 for the purpose of increasing the student’s scholarship award amount, or, for making the student scholarship eligible when the student was not eligible before February 1, 2019. • All scholarship awards are subject to change depending on fund availability, budgetary constraints, and the size/quality of the applicant pool. No commitment should be made by any party on behalf of the University other than authorized officials in the President’s Office, the Office of Student Financial Aid and/or the Office of Admissions. • All scholarship offers are time sensitive and must be accepted by the date specified in the scholarship award letter. • Scholarship awards are fixed dollar amounts that may be used to pay all University charges without respect to any specific charge. • Excellence scholarships are for incoming freshmen entering UNA in the summer or fall term immediately after graduation from high school. Payment of the scholarship award will begin in the fall semester. • The Office of Student Financial Aid will check grades of all first-year Excellence Scholarship recipients at the end of their first semester. A minimum earned GPA is required of incoming freshmen students in their first semester of the scholarship award. The student may lose the scholarship award for the second semester (spring semester) if the minimum GPA is not achieved. However, the student may regain eligibility for the scholarship in the summer semester following the loss of the scholarship. The student must achieve a satisfactory academic performance that meets the minimum renewal criteria. It is the student’s responsibility to be aware of this requirement. • SFA may refer to the Academic Success Center for advising, counseling, and further orientation all first-year Excellence Scholarship recipients earning less than a 3.00 GPA (2.75 for Leadership, Vanguard, and PMA) in their first semester. • Excellence Scholarships are renewable for seven additional semesters, excluding summer, as long as the renewal criteria are met as stated in the scholarship terms and conditions. PMA Scholarships may be renewed and payable for up to nine (9) additional semesters if the student meets the annual renewal criteria. • Only U.S. citizens are eligible for Excellence Scholarships. The student must be a full-time undergraduate US citizen student enrolled at UNA who is receiving an institutional scholarship award of $250 in recognition of a particular talent or ability, provided such student possessed the talent or ability at the time of initial enrollment and maintains continuous scholarship eligibility at UNA. Scholarship funds provided by the UNA Foundation and scholarships funded by external organizations do not qualify the student for the resident tuition rate. The student may no longer be eligible for the resident tuition rate at UNA if the student does not maintain continuous scholarship eligibility.